OMEGA’s PX80 is a heavy duty, wet/wet, differential pressure transducer available in ranges from ±1 to ±5000 psid. High over pressure capacity, high operating temperature and excellent temperature compensation make the PX80 an extremely accurate and reliable transducer. The all stainless steel and rugged construction allow it to withstand harsh industrial environments. ±50 psi differential transducer with 1/4 -18 NPT pressure fittings, a Bendix style electrical connector and a mV/V output. 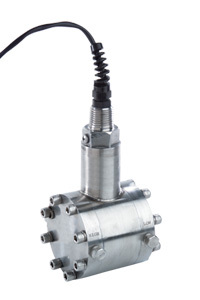 ±100 psi differential transducer with 1/4 -18 NPT pressure fittings, a Bendix style electrical connector and a mV/V output. ±200 psi differential transducer with 1/4 -18 NPT pressure fittings, a Bendix style electrical connector and a mV/V output. ±300 psi differential transducer with 1/4 -18 NPT pressure fittings, a Bendix style electrical connector and a mV/V output. ±500 psi differential transducer with 1/4 -18 NPT pressure fittings, a Bendix style electrical connector and a mV/V output. ±700 psi differential transducer with 1/4 -18 NPT pressure fittings, a Bendix style electrical connector and a mV/V output. ±1,000 psi differential transducer with 1/8 -27 NPT pressure fittings, a Bendix style electrical connector and a mV/V output. ±1,500 psi differential transducer with 1/8 -27 NPT pressure fittings, a Bendix style electrical connector and a mV/V output. ±2,000 psi differential transducer with 1/8 -27 NPT pressure fittings, a Bendix style electrical connector and a mV/V output. ±2,500 psi differential transducer with 1/8 -27 NPT pressure fittings, a Bendix style electrical connector and a mV/V output. ±3,000 psi differential transducer with 1/8 -27 NPT pressure fittings, a Bendix style electrical connector and a mV/V output. ±5,000 psi differential transducer with 1/8 -27 NPT pressure fittings, a Bendix style electrical connector and a mV/V output.